The Armenian Genocide of 1915, which saw the extermination of 1.5 million Armenians in the Ottoman Empire, still holds a significant place in the hearts of Armenian-Americans more than a century later. Hripsime “Rips” Karadjian, Revelle senior and cultural chair leader of the Armenian Genocide Commemoration Committee, described the horrors that took place. “They imprisoned and tried to deport all of these men and the intellectuals from their villages and towns, leaving the elderly, women and children behind to fend for themselves. Later they decided to send all of them on death marches and kill them along the way,” Karadjian explained to the UCSD Guardian. Originally a well-off nation that thrived on trade, Armenia suffered from the advent of religious conflict in the late 19th century between the mostly Christian Armenians and the Islamic Ottoman Empire that ruled the country. During the Ottomans’ struggle with Russia in World War I, the “Young Turks” who governed the Empire decided to relocate the Armenians in their territory who, living close to the border with Russia, were seen as a possible threat to the war effort; because they were Christian it was feared that they would side with mostly-Christian Russia. An estimated 600,000 to 1,000,000 Armenians perished in the resulting forced marches from 1915 to 1916. “We kind of want it to [be recognized] by the intellectual community as being on the same namesake level as the Holocaust, even though we realize that the numbers [for the Holocaust] were much larger, because Hitler’s inspiration for the Holocaust did come from the Armenian Genocide,” Karadjian said. 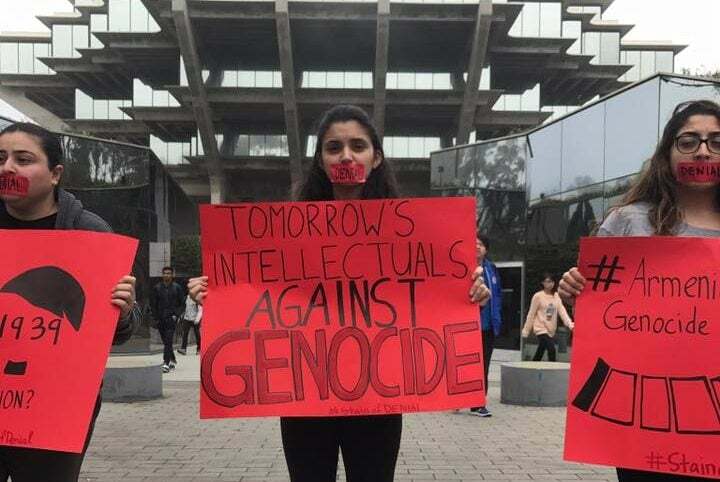 One of the ways the Armenian Students Association at UCSD aims to bring recognition to the genocide is through its annual protest, which this year was held at the Silent Tree in front of Geisel Library on Feb. 9. 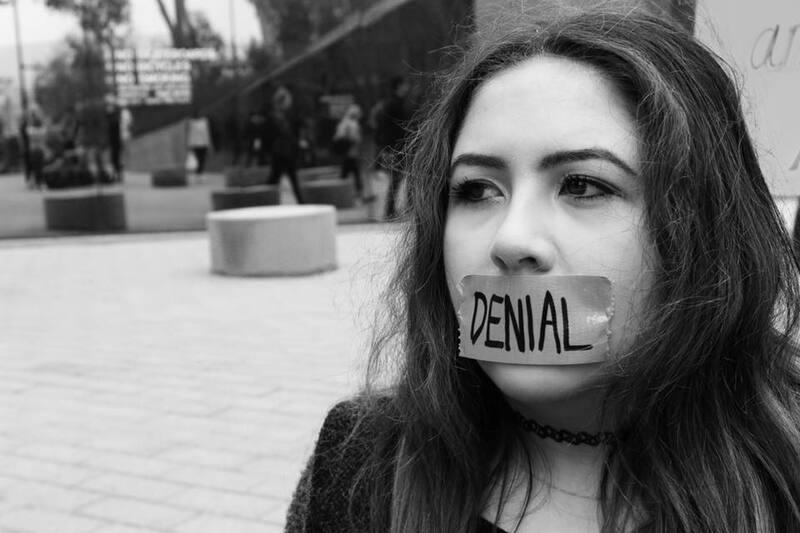 The guidelines for the protest provided by “All-ASA,” an organization which oversees ASAs in campuses throughout America, called for a decidedly different protest from the kind most college students are used to. In shifts of 12 to 15 members, the members of ASA gathered around the Silent Tree and held up eye-catching red and black posters with slogans such as “Tomorrow’s Intellectuals Against Genocide.” Perhaps what was the most striking was the red tape they wore over their mouths, with the word “DENIAL” written in dark black ink. “The red tape is symbolic of the years of silencing they’ve had; post genocide, the Ottoman Empire censored everything and made sure no one was talking about what happened,” Karadjian explained. To this day, the Republic of Turkey refuses to call the event a genocide. “They’re constantly in denial of it,” Karadjian said. This is the main reason why the ASA practices silent protests as opposed to a louder approach to gain people’s attention. “It’s unique, and it’s very symbolic of the way that they were silenced for so many years. Also, I feel like it unsettles people, ” said Karadjian. In fact, the gesture made the protesters appear more open and approachable: Students came up to them and asked questions about the genocide and other ASA awareness events, during which the ASA members took the tape off. However, not everyone is accepting of their cause on campus. Other protestors, the not-so-silent ones, can often present problems. One man in particular, a preacher who regularly visits campus and loudly advocates Christianity, has had many run-ins with ASA members. The preacher has apparently based his theories on a couple of college classes on the Ottoman Empire, and even brings quotes from textbooks to prove his point. Karadjian is used to dealing with the feeling of being marginalized. Growing up as Armenian but also half Filipino in predominantly Armenian Glendale, she often faced instances of racism. “I’m just as Armenian as the other kids I went to high school with, but because I don’t look typically Armenian, because of my eyes and because of my skin tone, I did experience a lot of racism in the Armenian community growing up,” she told the Guardian. For a time in her life she shunned her culture in favor of exploring a world outside “Little Armenia,” (as Glendale is often known); she rediscovered her love for her culture, however, when she came to UCSD as a junior transfer student and joined ASA. She encourages other Armenian-American students to join as well. Another member and historian of ASA, Eleanor Roosevelt College sophomore Anahit Topachyan, also extolled the benefits of joining ASA. This protest was just a precursor leading up to the main events that will take place during Genocide Awareness Week in April, which will commemorate the 102nd anniversary of the Genocide and promote a better understanding of what actually happened. Karadjian emphasized the importance of remembering the genocide by citing a famous quote attributed to Hitler. “‘Who, after all, speaks today of the annihilation of the Armenians?’ Um, us,” Karadjian retorted. “As an Armenian population, we do! And basically we want everyone to know and accept that the Armenian Genocide did happen and that so many people were massacred,” she told the Guardian. During Genocide Awareness Week, ASA will host a candlelight vigil, a priest from an Armenian church and, as a highlight, a tent-like setup which will portray the true stories of people (such as great-grandparents of students) affected by the genocide. Topachyan further explained that the massacre is significant to the lives of every single Armenian, even in America, whether they realize it or not. Topachyan believes that Armenian students should shed their hesitation and join ASA because of the many cultural benefits it offers. “I’m disappointed that not all American-Armenians join. A lot of these students are like, Americanized? Like they don’t want to be a part of the Armenian community. Maybe they had bad experiences or connotations, but we are very welcoming of everyone who wants to join and support. We want to be united,” she said.